Life came to a standstill across Nagaland as Naga civil society organizations (CSOs) under the banner of Nagaland GBs Federation imposed bandh on Monday from 6 am to 4 pm against citizenship bill. 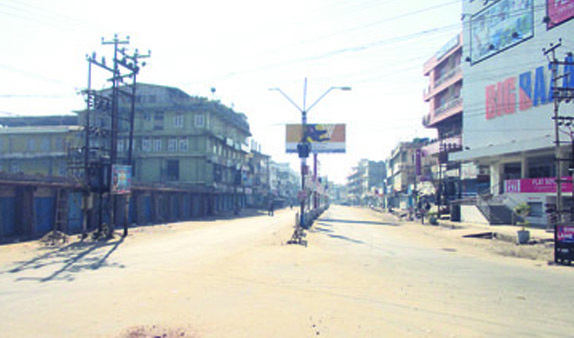 Vehicular traffic went off the road in capital Kohima, the commercial town of Dimapur and across all other places as the shutdown called against the contentious Citizenship (Amendment) Bill, 2016 evoked total response. Educational institutions, commercial establishments, shops, banks refused to open on Monday morning as all placess across the State wore a deserted look. Several organizations like the Joint Committee on Prevention of Illegal Immigrants (JCPI) had categorically stated that ‘under no circumstances will the bandh be called off’, according to reports. It, however, decided not to deploy any volunteers to enforce the bandh anywhere across the State. The supporters of the bandh said that they are leaving it to the people to make a ‘conscious decision’ to support the bandh in order to send a clear signal to the Centre that the preservation and the protection of the indigenous lives in the Northeast was of outmost priority. While informing that press and media were automatically exempted, JCPI said police, district administration, medical and emergency services, army & paramilitary forces, students and teachers on examination, pre-engaged programmes like weddings, autorickshaws or transportations ferrying students on examination, train and flight passengers, members of the NSCN (I-M) attending the National Hoho, etc. are also exempted from the purview of the bandh.